Midge and Moo are best friends. They came home from the hospital together when Midge was just two days old. Snuggle up with your little one and spend the day with Midge and Moo. I love writing and illustrating stories for kids! Stories are fun, but it’s more than that...each book a child reads is a doorway into understanding more about herself and more about the world she lives in. I want to create those doorways—to laughter, to learning, to imagined worlds, and most importantly... to connecting with each other. To connect with me, see stories and drawings in progress, plus receive free books and activities visit my website www.kerrymcquaide.com. "What a sweet and snuggly book! 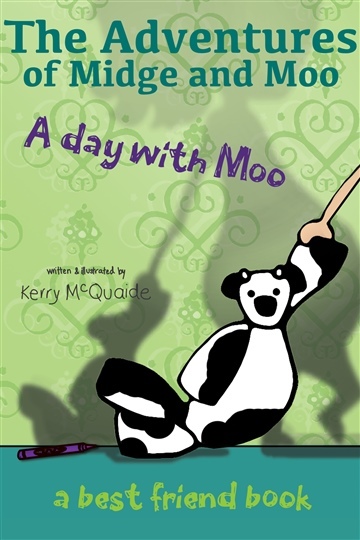 Join Midge and her best friend Moo in their daytime adventures. It's so wonderful to have a comforting book on my phone's Kindle App that we can use to cuddle and connect wherever we go." "This is a delightful book for young children about a little girl, Midge, and her best friend, a cute black and white toy bear named Moo. The friends play together, eat together, make a mess, wash and snuggle. Kerry McQuaide's book is an easily interpreted story without words. Her illustrations, two to a page, are expressive and funny. Midge and Moo are sure to make you and your child laugh." "The story is about the loving relationship between a little girl named Midge and her stuffed cow doll Moo.....Where ever Midge goes Moo follows during playtime, eating and sleepy time......Pure love."